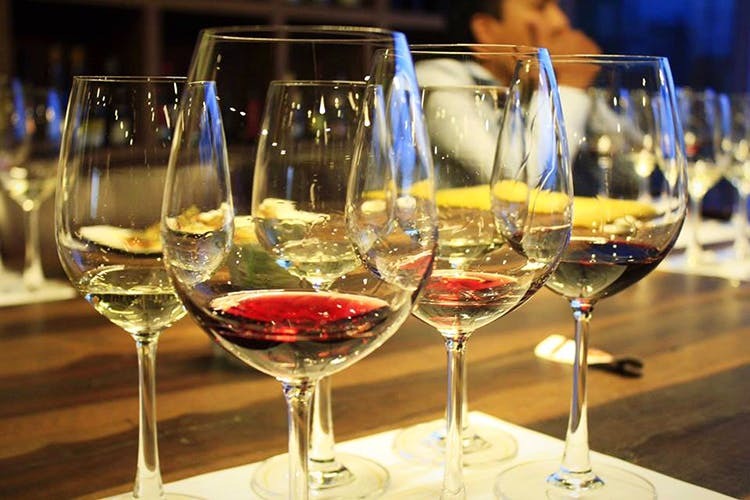 Tucked away on the busy Sarjapur Road, Enoteca By Madhuloka is a wine boutique and library where you can go to learn about wine, or just sit back, read a book and sip on your favourite white. If you live by the motto of In Vino Veritas, like I do, the Enoteca should certainly be on your places to visit this weekend. And every weekend after that! Why? Because it’s the city’s first, and only (thus far) wine library and education centre. See, drinking wine is an art. And we’d like to master it! The brain-child of KS Lokesh, founder of Madhuloka liquor boutique, Enoteca is modelled on a typical pub and European winery. This means, wooden chairs, tables, barrels and a ceiling-to-floor case stocked with exotic wines, ranging from limited edition Australian De Bortoli to Francis Ford Coppola’s Diamond Collection and of course, closer-to-home Sula and Four Seasons, and everything in between. No, really. There’s about 600 and counting, varieties of wine, domestic and international, available here. I went for a tasting, and while I do love my clubbing and adventure outings, I’d highly recommend this one for an outing with friends. And there’s something to learn from these tasting sessions whether you’re a novice or connoisseurs. If you take the drink very seriously, enrol for a course – Regular, Professional or Certified. And when you’re done demystifying the drink of the gods, their events will seem even more fun than before. There’s everything from cocktail making with wine to wining and then painting! You can’t say no to that, can you? You can even book the place for an event. So forget a fancy restaurant. Just reserve the whole space in advance, and invite your friends for an almost-in-the-vineyards experience. With a little library and a mini-theatre to watch a film of your choice, it practically the perfect place for a chic soiree. Let’s drink to that, shall we?